joe, phil, dave, and i braved the spookies of friday the 13th and checked out pure food and wine near union square. i was pretty excited; as sara noted when we chatted the other day, the food looks gorgeous (on their site, mind you - i know my photo stinks), and local foodie sites seem up on the place. two raw dishes and $75/person later, i say...meh. raw* food, like other vegan food, calls for a special kind of thinking: if you compare it to with eggy/milky/meaty versions of the same dish, you're going to be disappointed. unfortunately, raw food chefs like to mimic regular menu items, which is wildly hit-or-miss. 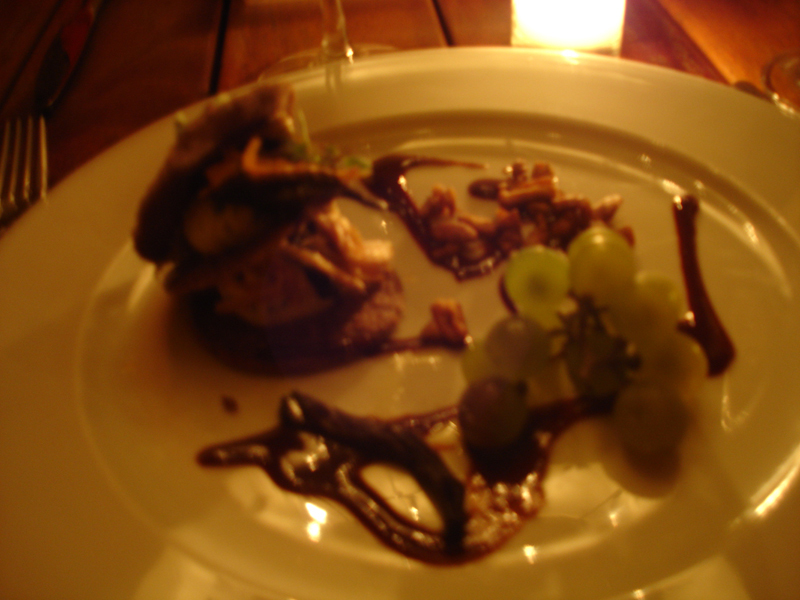 my appetizer (above), a napoleon of black trumpet mushrooms, was fabulous; the cashew 'cheese' wasn't cheesy, per se, but the texture was pleasant and the pinot noir sauce was lovely. my entree, on the other hand, was chalky parsnip 'pasta' with seriously overherbed sauce. joe said it reminded him of savory key lime pie, and if that sounds good to you, i'm never coming to a dinner party at your house. dessert - particularly dave's mint chip ice cream - was spectacular and is available for take-out; if you feel like going raw, i recommend picking up a carton of that** and skipping the full sit-down experience. then again, it's no secret that i have a white trash palate - if a splashy, wacky dinner is up your alley, give the ol' raw food a try. it's certainly singular. *per PF&W, "the term raw refers to keeping all of the ingredients under 118 degrees. this preserves food's natural enzymes which catalyze digestion. wheat, dairy, soy and refined sugars are naturally omitted in raw food preparation." **lord only knows how much it would cost, though; raw ice cream is coconut meat and cashew sweetened with agave nectar, which is freakishly expensive on its own. the restaurant's snack site suggests calling for prices. I liked my meal that night. I had the spicy thai lettuce wraps and the zuccini and golden tomato lasagna, and both were delicious, raw or not. admittedly, my first meal there failed to leave any kind of an impression, so I'll go along with the hit-or-miss judgement. macrobiotics on the other hand... all the gwyneths are doing it. oh wait. the french fries are ridiculously good, anyway. i like that gwynnie condemns butter and milk but says that she still eats cheese. totally different foodstuffs. i remember her rants back in the day about tomatoes, since they're "deadly nightshades." that sort of makes me want to eat more of them. what's that line from paltrow's fame audit on fametracker.com? "she acts like she invented blonde hair and yoga."